Caroline I hope your pkg arrives soon. For me that is always the most stressful part- waiting to see if it arrived safely. This being my first swap with this group compounds that too. I really am glad I finally looked and decided to join- now, if only your pkg would arrive I could breathe a sigh of relief and look forward to the next one. I love the way you are running this swap- giving us time - life sure interferes sometimes. You're right Pamela....I haven't received yet either. I am so sorry... I must have had a brain freeze due to the awful virus I have just had... still getting over it, but much better then I was. I have been putting down people as received when they have sent and vice versa! Okay..... so... Marion, Sue and myself are still to receive, but I know they are all in the mail, so... just waiting for posties around the globe to do their jobs! Personally I really like the Stars or Stripes one...as I can see a whole host of possibilities in the quilting world.... what do you think ladies? Get well soon Caroline. I also have the creepy crap.I got a antibiotic as soon as I felt it coming on. It's my 4th day and still very sore. I also like the opposites . theme. I never heard of that one. Always like something new to try. Sue I was just on Pinterest today looking at a bunch of runners. It does inspire me. Do you know what degree in firenhite 45 celsius is? Sorry for my bad spelling. I would love stars and stripes. well lawsonmugs, I had to google the conversion from Celsius to Fahrenheit! Yikes! Minus 45 Celsius is minus 49 Fahrenheit!!!!!!! Oh my freaking heaven! My 2 little dogs have decided they don't need to go out to pee nearly as often in this temperature! lol I have finally had days where I didn't need to use the snow shovel though! My runner arrived on Friday while I was away so I got it today. My thanks go to Pamela for this lovely batik log cabin. It just fits nicely on my table too.....and the extras! Hand lotion, pins and a blade for my rotary cutter. I like the Opposites idea too. And 45C like we are having a few of them now is 115F a bit hot! 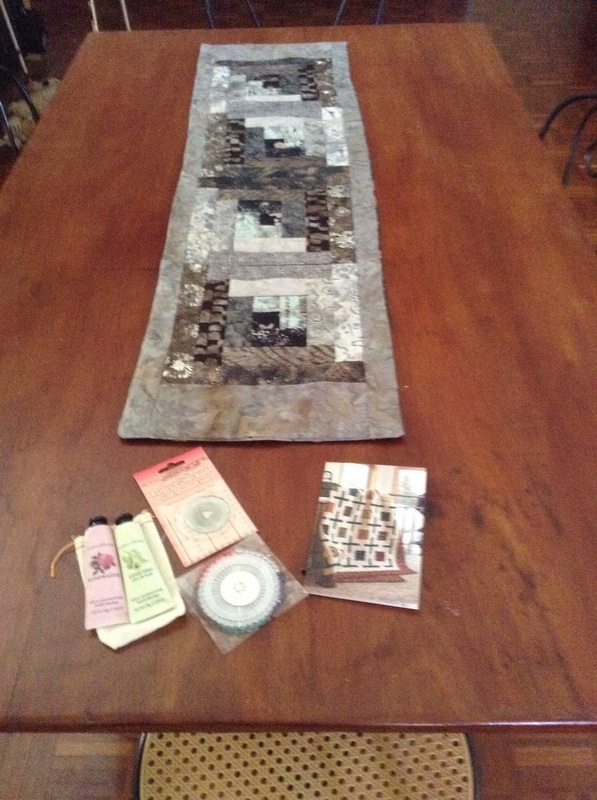 Beautiful LC from Pamela...Gorgeous fabrics that looks wonderful on your table. Fun goodies, too. Oh my, oh my! Just received my mail, & there was an envelope from Rosalyn (r-sea)! I'm literally drooling over the beautiful table runner! and the goodies! Have to be very careful of the drooling, because I've already broken open the candy bag! lol Thank you so much Rosalyn! I think I bought a wave ruler years ago, but didn't have much success. Thinking I better pull it out & try again, now that I can see how it "should" look! I so love this swap! Oh wow, Sue....that is way cool! Just beautiful! R-Sea....amazing job on this runner and thoughtful goodies..
Lovely runner M-fay, There is so many different ways the log cabin design can be used . Even the one Sue received was made with that in mind . These runners are so pretty. Lots of thought and work went into this months swaps. It shows too, they have all been so pretty. 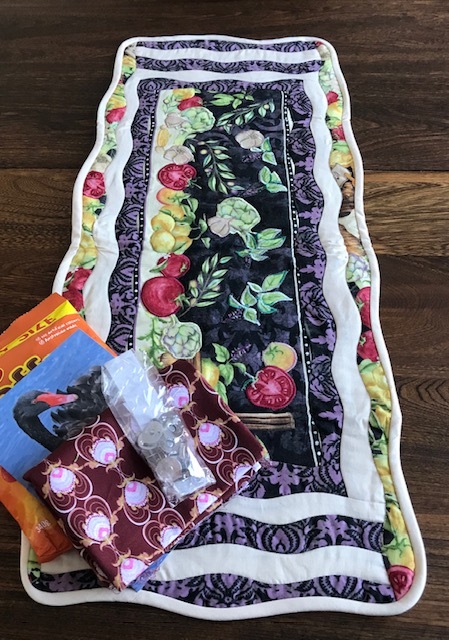 I have received a lovely table runner from Colleen (as you can see below) so I can close this swap and mark it yet again 100% successful. Also ladies, I have created a list of ideas to keep for the future so would be grateful of you could PM me all your wonderful ideas so I can use them in the coming swaps. Thank you, Caroline, for hosting this fun swap. Such lovely participants and fantastic runners. Will be joining again soon. How pretty and colorful your runner. Cute pattern and fabrics. See ya on the next swap. thank you Caroline for the time & effort you put into the runner swap! Hope we aren't too tough on you! I like that French Braid style runner. Nice finish. It has been a lovely swap. All the runners are fantastic. Thank you, Caroline, as always for doing the hard work of keeping the group up and running. See you all in the next swap. [QUOTE=Northern Sue;8197321]Oh my, oh my! Just received my mail, & there was an envelope from Rosalyn (r-sea)! I'm literally drooling over the beautiful table runner! and the goodies! Have to be very careful of the drooling, because I've already broken open the candy bag! lol Thank you so much Rosalyn! I think I bought a wave ruler years ago, but didn't have much success. Thinking I better pull it out & try again, now that I can see how it "should" look! I so love this swap! I somehow missed seeing this wonderful veggie patch. Nice curves!